This section guides first-time contributors through installing the Zulip development environment on Windows, macOS, Ubuntu and Debian. The recommended method for installing the Zulip development environment is to use Vagrant with VirtualBox on Windows and macOS, and Vagrant with LXC on Ubuntu. This method creates a virtual machine (for Windows and macOS) or a Linux container (for Ubuntu) inside which the Zulip server and all related services will run. If you encounter errors installing the Zulip development environment, check Troubleshooting and Common Errors. If that doesn’t help, please visit #provision help in the Zulip development community server for real-time help, send a note to the Zulip-devel Google group or file an issue. All: 2GB available RAM, Active broadband internet connection, GitHub account. Windows: Windows 64-bit (Win 10 recommended), hardware virtualization enabled (VT-X or AMD-V), administrator access. Other Linux distributions work great too, but we don’t maintain documentation for installing Vagrant and LXC on those systems, so you’ll need to find a separate guide and crib from the Debian/Ubuntu docs. You can skip this step if you already have Git, GitHub, and SSH access to GitHub working on your machine. Follow our Git Guide in order to install Git, set up a GitHub account, create an SSH key to access code on GitHub efficiently, etc. Be sure to create an ssh key and add it to your GitHub account using these instructions. If you are running MacOS High Sierra, make sure you are not running a version with a buggy NFS implementation. Versions 10.13.2 and above have the bug fixed. Now you are ready for Step 2: Get Zulip Code..
For a step-by-step explanation, read on. For Ubuntu 16.04 Xenial and 14.04 Trusty, you’ll need a more recent version of Vagrant than what’s available in the official Ubuntu repositories. Installed the plugin 'vagrant-lxc (1.2.1)'! If you encounter an error when trying to install the vagrant-lxc plugin, see this. If you encounter an error running vagrant lxc sudoers, see this. Now you are ready for Step 2: Get Zulip Code. Set up LXC networking. After completing “2. Install remaining dependencies”, you will have to set up networking for LXC containers, because Debian’s packaging for LXC does not ship any default network setup for them. You can do this by following the steps outlined in Debian’s LXC docs. Then return to the next step in the Ubuntu instructions above. After finishing those steps, you will be ready for Step 2: Get Zulip Code. Install Git for Windows, which installs Git BASH. Install Vagrant (version 2.0.2 is best tested). Also, you must have hardware virtualization enabled (VT-X or AMD-V) in your computer’s BIOS. It is important that you always run Git BASH with administrator privileges when working on Zulip code, as not doing so will cause errors in the development environment (such as symlink creation). You might wish to configure your Git BASH shortcut to always run with these privileges enabled (see this guide for how to set this up). The Zulip code includes symbolic links (symlinks). By default, native Windows symlinks are not enabled in either Git BASH or Cygwin, so you need to do a bit of configuration. You must do this before you clone the Zulip code. If you see true, you are ready for Step 2: Get Zulip Code. Otherwise, if the above command prints false or nothing at all, then symlinks have not been enabled. In your browser, visit https://github.com/zulip/zulip and click the fork button. You will need to be logged in to GitHub to do this. Open Terminal (macOS/Ubuntu) or Git BASH (Windows; must run as an Administrator). This will create a ‘zulip’ directory and download the Zulip code into it. remote: Counting objects: 73571, done. Receiving objects: 100% (73571/73571), 105.30 MiB | 6.46 MiB/s, done. Resolving deltas: 100% (51448/51448), done. Now you are ready for Step 3: Start the development environment. Change into the zulip directory and tell vagrant to start the Zulip development environment with vagrant up. runs the tools/provision script inside the virtual machine/container, which downloads all required dependencies, sets up the python environment for the Zulip development server, and initializes a default test database. We call this process “provisioning”, and it is documented in some detail in our dependencies documentation. You will need an active internet connection during the entire process. (See Specifying a proxy if you need a proxy to access the internet.) vagrant up can fail while provisioning if your Internet connection is unreliable. To retry, you can use vagrant provision (vagrant up will just boot the guest without provisioning after the first time). Other common issues are documented in the Troubleshooting and Common Errors section. If that doesn’t help, please visit #provision help in the Zulip development community server for real-time help. On Windows, you will see The system cannot find the path specified. message several times. This is expected behavior and is not an error. Congrats, you’re now inside the Zulip development environment! You can confirm this by looking at the command prompt, which starts with (zulip-py3-venv)vagrant@. If it just starts with vagrant@, your provisioning failed and you should look at the troubleshooting section. Quit the server with CTRL-C.
webpack: bundle is now VALID. Now the Zulip server should be running and accessible. Verify this by navigating to http://localhost:9991/ in the browser on your main machine. Now you’re ready for Step 4: Developing. You’ll work by editing files on your host machine, in the directory where you cloned Zulip. Use your favorite editor (Sublime, Atom, Vim, Emacs, Notepad++, etc.). When you save changes they will be synced automatically to the Zulip development environment on the virtual machine/container. 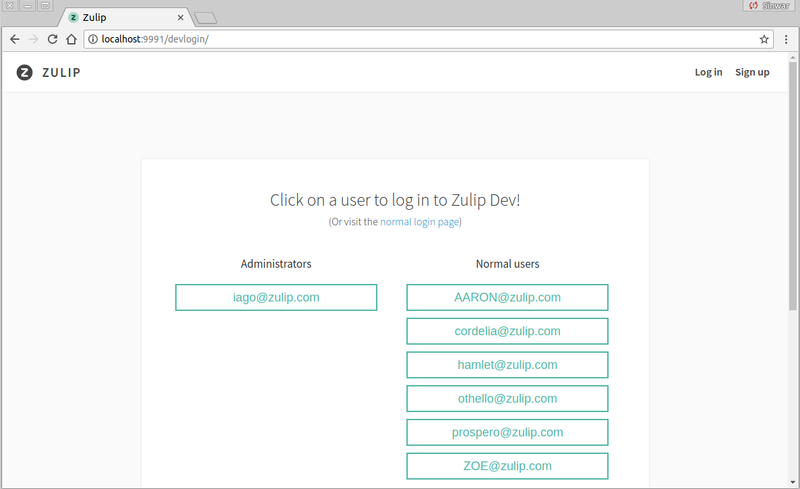 Each component of the Zulip development server will automatically restart itself or reload data appropriately when you make changes. So, to see your changes, all you usually have to do is reload your browser. More details on how this works are available below. Zulip’s whitespace rules are all enforced by linters, so be sure to run tools/lint often to make sure you’re following our coding style (or use tools/setup-git-repo to run it on just the changed files automatically whenever you commit). It’s good to have the terminal running run-dev.py up as you work since error messages including tracebacks along with every backend request will be printed there. See Logging for further details on the run-dev.py console output. When you’re ready to commit or push changes via git, you will do this by running git commands in Terminal (macOS/Ubuntu) or Git BASH (Windows) in the directory where you cloned Zulip on your main machine. If you’re new to working with Git/GitHub, check out our Git & GitHub Guide. If after rebasing onto a new version of the Zulip server, you receive new errors while starting the Zulip server or running tests, this is probably not because Zulip’s master branch is broken. Instead, this is likely because we’ve recently merged changes to the development environment provisioning process that you need to apply to your development environment. To update your environment, you’ll need to re-provision your vagrant machine using vagrant provision (this just runs tools/provision from your Zulip checkout inside the Vagrant guest); this should complete in about a minute. After provisioning, you’ll want to (re)start the Zulip development server. If you run into any trouble, the #provision help in the Zulip development community server for is a great place to ask for help. If you ever want to recreate your development environment again from scratch (e.g. to test as change you’ve made to the provisioning process, or because you think something is broken), you can do so using vagrant destroy and then vagrant up. This will usually be much faster than the original vagrant up since the base image is already cached on your machine (it takes about 5 minutes to run with a fast Internet connection). Any additional programs (e.g. Zsh, emacs, etc.) or configuration that you may have installed in the development environment will be lost when you recreate it. To address this, you can create a script called tools/custom_provision in your Zulip Git checkout; and place any extra setup commands there. Vagrant will run tools/custom_provision every time you run vagrant provision (or create a Vagrant guest via vagrant up). To shut down but preserve the development environment so you can use it again later use vagrant halt or vagrant suspend. You can do this from the same Terminal/Git BASH window that is running run-dev.py by pressing ^C to halt the server and then typing exit. Or you can halt vagrant from another Terminal/Git BASH window. Check out the Vagrant documentation to learn more about suspend and halt. Testing (and Configuring CI to run the full test suite against any branches you push to your fork, which can help you optimize your development workflow). Below you’ll find a list of common errors and their solutions. Most issues are resolved by just provisioning again (by running ./tools/provision (from /srv/zulip) inside the Vagrant guest or equivalently vagrant provision from outside). a copy of Zulip’s vagrant provisioning logs, available in /var/log/provision.log on your virtual machine. If you choose to post just the error output, please include the beginning of the error output, not just the last few lines. The output of tools/diagnose run inside the Vagrant guest is also usually helpful. The ESC stuff are the terminal color codes that make it show as a nice blue in the terminal, which unfortunately looks ugly in the logs. If you encounter an incomplete /var/log/provision.log file, you need to update your environment. Re-provision your vagrant machine; if the problem persists, please come chat with us (see instructions above) for help. After you provision successfully, you’ll need to exit your vagrant ssh shell and run vagrant ssh again to get the virtualenv setup properly. This is equivalent of running a halt followed by an up (aka rebooting the guest). After this, you can do vagrant provision and vagrant ssh. It means that either your network connection is unstable and/or very slow. To resolve it, run vagrant up until it works (possibly on a better network connection). ==> default: E:unmet dependencies. Try 'apt-get -f install' with no packages (or specify a solution). It usually means the Vagrant guest is not running, which is usually solved by rebooting the Vagrant guest via vagrant reload. See Vagrant was unable to communicate with the guest machine for more details. Then Vagrant was not able to create a symbolic link. First, if you are using Windows, make sure you have run Git BASH (or Cygwin) as an administrator. By default, only administrators can create symbolic links on Windows. Second, VirtualBox does not enable symbolic links by default. Vagrant starting with version 1.6.0 enables symbolic links for VirtualBox shared folder. You can check to see that this is enabled for your virtual machine with vboxmanage command. If you see “command not found” when you try to run VBoxManage, you need to add the VirtualBox directory to your path. On Windows this is mostly likely C:\Program Files\Oracle\VirtualBox\. The virtual machine needs to be shut down when you run this command. A likely cause is that hardware virtualization is not enabled for your computer. This must be done via your computer’s BIOS settings. Look for a setting called VT-x (Intel) or (AMD-V). If this is already enabled in your BIOS, double-check that you are running a 64-bit operating system. For further information about troubleshooting vagrant timeout errors see this post. Downloads an Ubuntu image and starts it using a Vagrant provider. Uses vagrant ssh to connect to that Ubuntu guest, and then runs tools/provision, which has a lot of subcommands that are executed via Python’s subprocess module. These errors mean that one of those subcommands failed. To debug such errors, you can log in to the Vagrant guest machine by running vagrant ssh, which should present you with a standard shell prompt. You can debug interactively by using e.g. cd zulip && ./tools/provision, and then running the individual subcommands that failed. Once you’ve resolved the problem, you can rerun tools/provision to proceed; the provisioning system is designed to recover well from failures. The zulip provisioning system is generally highly reliable; the most common cause of issues here is a poor network connection (or one where you need a proxy to access the Internet and haven’t configured the development environment to use it. Zulip development environment setup succeeded! If the (zulip-py3-venv) part is missing, this is because your installation failed the first time before the Zulip virtualenv was created. You can fix this by just closing the shell and running vagrant ssh again, or using source /srv/zulip-py3-venv/bin/activate. Finally, if you encounter any issues that weren’t caused by your Internet connection, please report them! We try hard to keep Zulip development environment provisioning free of bugs. Insufficient RAM. Check whether you’ve allotted at least two gigabytes of RAM, which is the minimum Zulip requires. If not, go to your VM settings and increase the RAM, then restart the VM. warning fsevents@1.1.1: The platform "linux" is incompatible with this module. info "fsevents@1.1.1" is an optional dependency and failed compatibility check. Excluding it from installation. When building the development environment using Vagrant and the LXC provider, if you encounter permissions errors, you may need to chown -R 1000:$(id -g) /path/to/zulip on the host before running vagrant up in order to ensure that the synced directory has the correct owner during provision. This issue will arise if you run id username on the host where username is the user running Vagrant and the output is anything but 1000. This seems to be caused by Vagrant behavior; for more information, see the vagrant-lxc FAQ entry about shared folder permissions. And you have vagrant version 1.8.1, then you need to patch vagrant manually. See this post for an explanation of the issue, which should be fixed when Vagrant 1.8.2 is released. In the meantime, read this post for how to create and apply the patch. Users who are unable to do “vagrant up” due to a VT-X unavailability error need to disable “Hyper-V” to get it to work. default: Actual error output for the subcommand is just above this. default: * Look at the traceback(s) above to find more about the errors. default: * Resolve the errors or get help on chat. default: * If you can fix this yourself, you can re-run tools/provision at any time. This error is caused by a bug in the MacOS NFS file syncing implementation (Zulip uses Vagrant’s NFS feature for syncing files on MacOS). In early versions of MacOS High Sierra, files present in the directory on the host machine would appear to not be present in the Vagrant guest (e.g. in the exception above, zerver/lib/emoji.py is missing). This bug is fixed in MacOS High Sierra 10.13.2 and above, so the fix is to upgrade to a version of MacOS with a working NFS implementation. Now run vagrant up in your terminal to install the development server. If you ran vagrant up before and failed, you’ll need to run vagrant destroy first to clean up the failed installation. If you no longer want to use proxy with Vagrant, set values of HTTP_PROXY and HTTPS_PROXY to "" in ~/.zulip-vagrant-config file and restart Vagrant. (and halt and restart the Vagrant guest), then you would visit http://localhost:9971/ to connect to your development server. (and restart the Vagrant guest), your host IP would be 0.0.0.0, a special value for the IP address that means any IP address can connect to your development server.